HomeCan't Pay? We'll Take It Away! Can't Pay? We'll Take It Away! is a TV show on British national television from Channel 5 with an average rating of 3.5 stars by TelevisionCatchUp.co.uk's visitors. 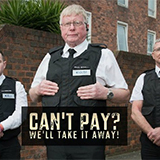 We have 537 episodes of Can't Pay? We'll Take It Away! in our archive. The first episode of Can't Pay? We'll Take It Away! was broadcast in April, 2019. Did you miss an episode of Can't Pay? We'll Take It Away! but don't you wan't that to happen in the future? Please set an alarm and add Can't Pay? We'll Take It Away! to your favourites, so we can remind you by email when there's a new episode available to watch. For free! The repossession agents come across an extremely rare car. The enforcement agents tackle a runaway tenant. Steve and Paul evict people for rent arrears. The agents visit a phone shop that has rung up a huge debt.